The entire house & property must be cleaned and restocked between visitors. Please adhere to the posted departure and arrival times. The garage is equipped with shelves, hangers and rod holders for waders, wading shoes, ski boots and other gear. Please do not wear them in the house! It’s always wonderful to share our travels with our pets! I have allowed visitors to have pets on the premises because I know how enjoyable they are to all of us. However, there are issues attributed to pets – such as destruction of property, cleanliness, noise and disruption of the residential neighborhood. There is a pet fee. If you have not already done so, please report your pet to the Agent that reserved the house for you. The entire fee goes to the extra cleaning of the house involving one’s pet! If there is damage to the house or yard due to your pet, I have no recourse but to charge for repairs or replacement of the damaged property. Please do not leave your pet unattended indoors during the day or evening. Make sure your pet is content and will not destroy property or bark excessively. This is a residential neighborhood. Please keep your pet under control at all times. Don’t let it wander into neighbor’s yards or run freely in the street. Dunsmuir strictly enforces its leash law. There is seldom an incident involving a pet, and over the years I’ve enjoyed meeting all kinds of wonderful animals. I hope you and your pet enjoy the area. Thanks! 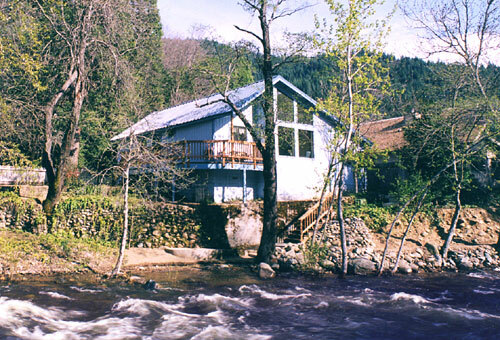 Nestled between a quiet lane and the Upper Sacramento River, this home is an ideal place to enjoy a stay in Dunsmuir. The home takes full advantage of the beauty of the river. Decks, walkways and windows overlook one of the best fishing stretches of the Upper Sacramento River, and are easily accessible from the property. 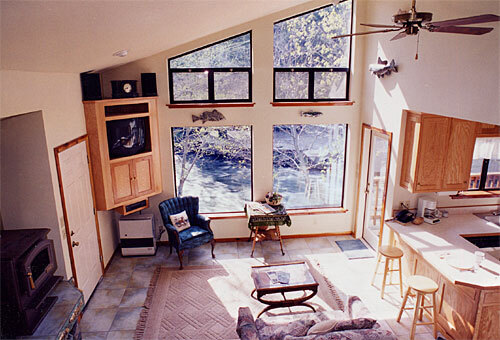 From the windows of the home, animals such as minks, otters, osprey and megansers are frequently seen traveling the shoreline or fishing the river. The overlying function & artistic theme of the home revolves around outdoor recreation, fishing, hiking and skiing. Artwork displayed in the home has been, in most cases, created by Fred Gordon who focuses on aquatic sculpture and paintings.